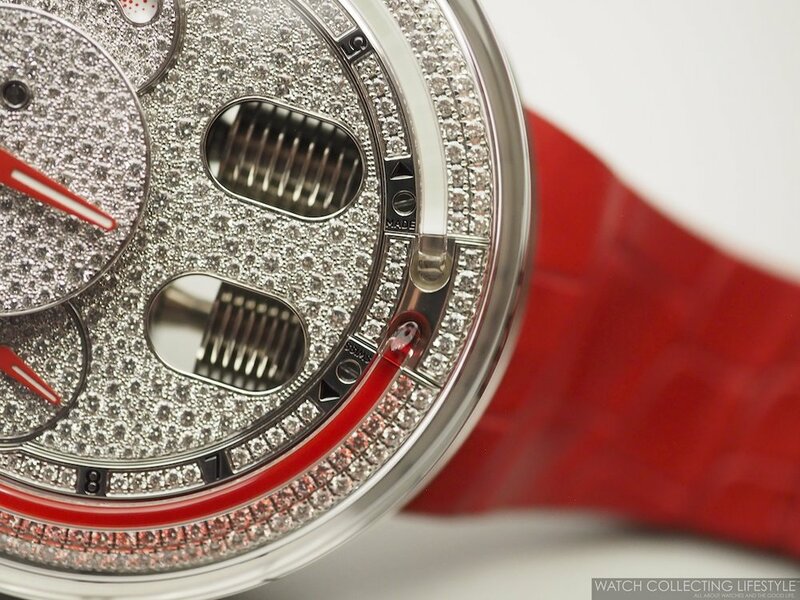 An unprecedented watch by HYT but one that happens to work very well with its dial full of diamonds. As they say, diamonds are allegedly forever, but how long is forever? And as Marylin Monroe would say: “ Diamonds are a girl’s best friend,” but in this case and due to the nature of the HYT watches they are also a man’s best friend as these pair of HYT H0 Diamonds are entirely unisex. On the new H0 Diamonds, a total of 1,206 diamonds totaling 7.43 carats flow through the design of the dial and every corner of it to interplay with light and sparkle through every millimeter of the watch. Underneath the water drop-like sapphire glass on the H0 1,206 snow-set diamonds give the impression of water droplets delivered directly by nature. They enchant with their spontaneous irregularity. As they catch the light and cascade down the interior sides of the crystal as precious stone waterfalls. Available in two different variants, the HYT H0 Diamonds is available with red fluid and a matching red alligator strap and in black fluid with a matching black alligator straps. Both watches are cased in a generous 48.8 mm stainless steel —which helps keeping the pricing under six figures despite of the use of diamonds— and powered by the manual wound HYT calibre 101 with 35 jewels. The movement beats at a frequency of 28,800 to provide a power reserve of 65 hours. This amazing movement with HYT’s exclusive patented micro-fluidic module includes two multi-layer metal bellows, capillary tube in medical grade glass with interior nano-coating, two immiscible liquids —one transparent and the other colored with a highly resistant dye—, thermal compensator with dedicated bellows containing a special liquid and ceramic fluid restrictors. 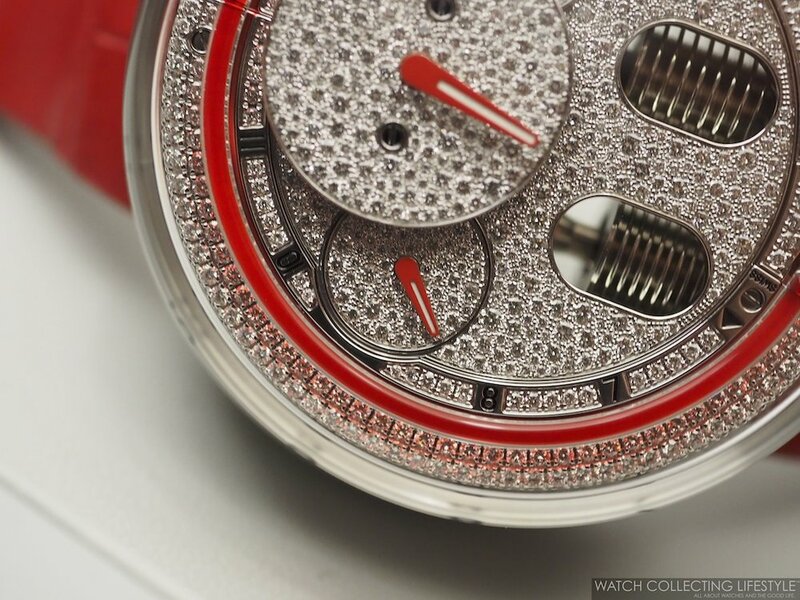 On the wrist, the new HYT H0 Diamonds either in red or black wears true to its size and just like its siblings. However, the iced out nature of its dial works very well with the fluid capillary in either color. Even though we are not big fans of diamonds on watches, these two watches are stunning and very eye-catching. Some serious eye candy for diamond lovers. If we could chose one of the two, we would go with the red as diamonds and the color of love go very well together. Sticker Price $89,000 USD for either color. For more info on HYT click here. Posted on April 12, 2019 by Editor & Publisher and filed under HYT and tagged HYT 2019 HYT Diamonds Red HYT Diamonds Black HYT H0 HYT H0 Diamonds Red HYT H0 Diamonds Black Independent Watchmaking Hydromechanical Watch HYT Hydromechanical Watches Hydromechanical Horologists Most Popular.